Like chicken, salmon is thankfully super easy and quick to cook. The only thing you have to be careful of is not to overcook the delicate flesh. I normally pull my salmon off the grill or pan while it’s still a little reddish-pink in the middle… it continues to cook to a tender texture. I’m also an advocate for wild salmon, and most are sourced from the Pacific Ocean. For flavor, texture, nutrients and color, king (or Chinook), sockeye and coho are all superior to any farmed salmon. But if that’s all you can find, don’t hold back. Here’s an informative NYT article about farmed versus wild salmon. Peak season for wild salmon is late summer, so cash in and freeze some for later enjoyment. Like the waters it originates from, it handles the cold well. Here’s a chart showing the seasonal availability for different species. 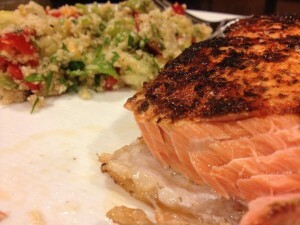 This recipe for Blackened Salmon feeds 4 people, takes about 20 minutes to prepare and is unbelievably simple to make. Serve with a chilled rosé wine or spicy red, such as Zinfandel. 1. Combine both pepper powders, thyme and garlic salt in a small bowl. 2. In a small bowl. melt butter in the microwave for 30 second or until liquid. Remove from microwave and stir in lemon juice. 3. Place salmon on a large plate or platter, pour the butter/lemon juice mixture over both sides of the fish. Evenly sprinkle both sides of the fish with the pepper mixture. Pat it in with dry hands once it’s been distributed. 4. Heat a heavy-bottomed or cast iron pan over medium-high heat. Add oil. It’s important that the pan be hot so the fish won’t stick. 5. Place fish, skin side down and cook undisturbed for 3-4 minutes then flip it over until desired doneness. I prefer mine about 4 minutes after I turn it over. A fantastic, seasonal side dish to Blackened Salmon is Roasted Green Beans with Tomato, Garlic Vinaigrette.